In 2010, FIERCE launched Queer Pier, 40 Years, an arts-based initiative exploring the intersections of archiving, cultural history and public space in community-making and social change. Queer Pier, 40 Years connectedLGBTQ youth of color and queer artists in documenting their histories, cultures and future visions for queer liberation through arts and media. 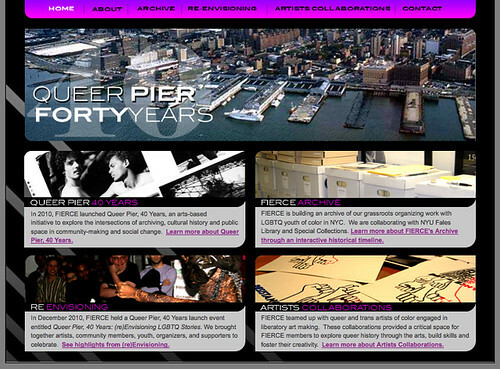 The project was launched to coincide with FIERCE’s 10th Anniversary, and its work included building an archive of FIERCE’s work, pairing queer artists of color with FIERCE youth leaders in interactive art projects, and creating a Queer Pier website to features highlights from the project and the first-ever digital chronological timeline of FIERCE's history from 2000-2010, complete with rarely seen photos and videos from the FIERCE archive. Queer Pier, 40 Years was conceived and organized by FIERCE’s Art Crew, a group of FIERCE members, board, and staff, along with artists, activists, educators, allies and cultural workers. The Art Crew was created to explore ways to expand arts programming in FIERCE and connect youth member leaders and artists interested in queer history, public space and queer people-of-color organizing through the process of collective archiving and art-making projects. Funding for Queer Pier, 40 Years was generously provided by the Documentary and Photography Project of the Open Society Foundations and by funding from the Arcus Foundation.